Lancome Absolue L'Extrait Serum, 1 oz. LancomeAbsolue L'Extrait Serum, 1 oz. Backed by the work of our research, Absolue L'Extrait continues to offer women a new generation of skin-rejuvenating efficacy with the creation of Absolue Pressé of the Lancôme Rose native cells. 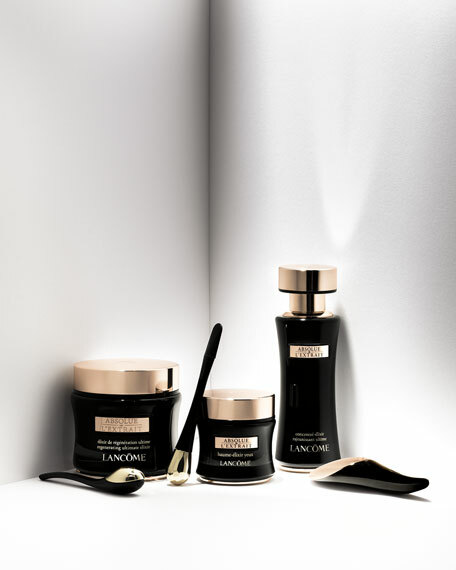 Through a patented high-pressure cell dissociation process, the Lancôme Rose native cells are fractures to release their rejuvenating potential. This also imparts a surprising soft, velvety texture for an ultimate sensorial experience. The fresh pearl-like gel-emulsion transforms upon contact with the skin into a light elixir, immediately enhancing the look of skin. Day after day, it effectively reveals signs of youth for a rejuvenated look. Imperfections look visibly reduced, and skin texture looks more refined. A remarkably radiant and beautiful-looking skin is revealed.